Did you recently receive orders for a military PCS to the Charleston area? Read on for helpful information about neighborhoods, schools, and more! Greater Charleston is served by three major military presences. Charleston Air Force Base and The Charleston Naval Weapons Station have merged to create the USAF controlled Joint Base Charleston (JB Charleston) near Goose Creek. The Coast Guard Charleston Base, in downtown Charleston, also contributes to the military existence in the region. Smaller military entities do exist as well. Travel to Charleston is relatively easy. Interstate 95 offers access for a majority of the journey into Charleston from the Eastern Seaboard. When flying, expect to make stops into larger airports such as Charlotte Douglas International Airport or Atlanta International Airport to make connections into Charleston International Airport in North Charleston. Direct flights do occur, particularly from eastern cities, such as Washington D.C. Charleston’s airport is on the smaller side, easily navigable, with rental cars very accessible. The weather is a huge draw for those who chose to relocate to the Charleston area. Mild and short winters, a flower-filled spring season, and the best place in the country to spend an October make Charleston a year-round activity filled destination. Although a sea breeze helps to cool the coastal areas, summers are brutally hot and humid in addition to long lasting, making beach lovers happy. The unpredictability of hurricanes and flooding are events to consider, particularly in the low lying neighborhoods of downtown. Flood insurance is also a very real possibility and should be investigated. It’s reasonable to expect work and school cancellations for potential hurricane activity. Downtown Charleston and the neighborhoods directly surrounding are probably not conducive to those military members commuting to JB Charleston, located about 30 minutes north in Goose Creek. There is a chance, however, that the location may work for those stationed at the Coast Guard base in downtown Charleston. Higher rents and lower school scores may prohibit this area. Consult Military Town Advisor for helpful advice from knowledgeable military families. A search at MilitaryByOwner will show Summerville, Ladson, Hanahan, and Goose Creek are conveniently located near JB Charleston and heavily populated by military families. West Ashley, James Island, and Mt. Pleasant are other viable options, but some of the commute times will be longer to JB Charleston. Public schools in the Charleston area are varied to the extreme. Low and high performing schools are mixed in every neighborhood, to include the housing areas at JB Charleston. It's critical to research which schools are assigned to your housing preferences. It is not uncommon for families to compete for magnet and charter schools, homeschool, or invest in the expense for private school. A unique characteristic of Charleston is the predominance of colleges. There are several major schools to include the College of Charleston, The Medical University of Charleston and The Citadel, found directly downtown. Offshoot campuses and smaller universities are found in North Charleston and surrounding cities. The influx of college students can pose a challenge when searching for rentals, especially within walking distances of these schools. Enjoy your time in Charleston! 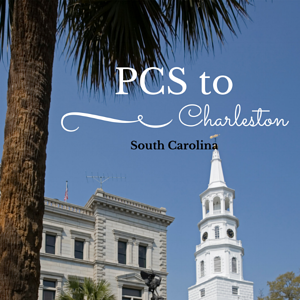 For more information about a PCS to Charleston, be sure to read my post on Exploring Charleston’s Historic Downtown.